If your library consists of a lot of classical works, there’s a little trick you can use to make the display a little easier to read. By default, a classical album will display the same as any other album with the track names appearing in a long list. However, typically the tracks making up a classical album contain a much more structured track title. Having this displayed over and over again can be a little repetitive and I find hard to scan. But we can tidy this up. Select a track & choose View > Get Info. If you look next to the song label, you can see an up/down arrow widget. If you click this widget, you can change the song title to a work title. This changes the metadata fields to be similar to the components I described earlier. 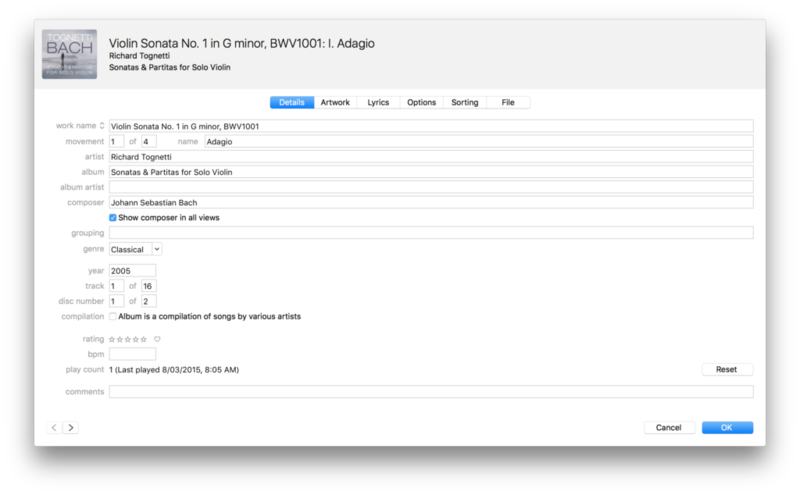 iTunes is pretty smart & normally detects the correct metadata components, but you can edit the movement numbers and name to suit yourself. Once you’ve changed each track in the album, the album track information will display grouped by work with each movement in a list below. I find this a much easier to read format. This entry was posted on Thursday, June 8th, 2017 at 8:00 am	and is filed under Apple, Music, Tutorial. You can follow any responses to this entry through the RSS 2.0 feed. Both comments and pings are currently closed.